Dave Matthews Band were amongst the first to denounce the violence and hate in Charlottesville, VA, last month, and now they've revealed plans to reintroduce some love into their hometown. They'll headline a benefit concert on September 24 at UVA Scott Stadium in Charlottesville. Also confirmed on the bill so far are Pharrell Williams, Justin Timberlake, Chris Stapleton, Ariana Grande, the Roots, Alabama Shakes' Brittany Howard and Cage the Elephant. Other "special guests" have also been promised. 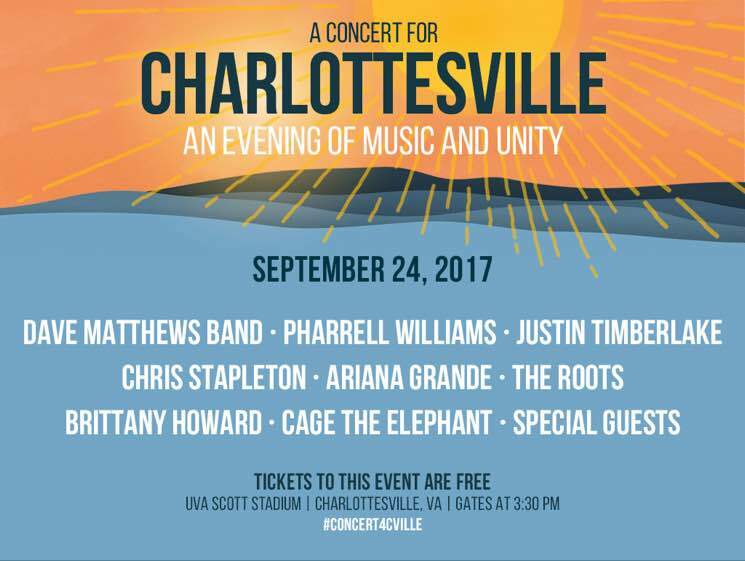 Tickets to the event are free, though organizers are encouraging attendees to donate to the Concert for Charlottesville Fund at the Charlottesville Area Community Foundation. Ticket priority will be given to residents of Charlottesville and the surrounding counties, as well as University of Virginia students, faculty and staff members. Ticket requests and donations can be made over here.